Since this occured within a short drive of where I live I have wittnessed the impact on wildlife the commnunities and the vegetation along the river. Beavers have moved to small creeks to get away from the destruction that can still be seen along the banks of the Kalamazoo River and downstream. 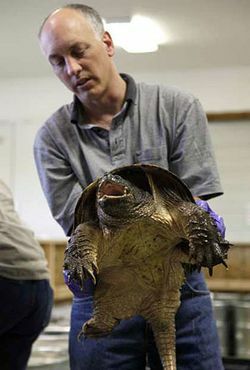 Jake Richardson posted this article on cleaning turtles. The link above. In case any people living along the spill site may need to know. It's so sad, the animals who only want to live in peace are usually the most effected by man's incompetence. what's with all these oils spills? Sadly noted, it is high time that this industry was bought to justice for the appauling number of spills in history, they have probably killed more animals than everyone else put together. Time for an alternative fuel is long overdue.